Early starts on a construction site…scramble through roll call and keep missing deadlines? SBE International are specialists in the field of workforce management solutions with customised software to assist various markets with Time and Attendance and Payroll administration. With major brand clients in the construction market, we are capable of assisting any construction site with their Time and Attendance headaches. We boast a unique mobile biometric fingeprint device that are connected to the GSM network, making it possible to assist remote constructions sites with a time and attendance solution. 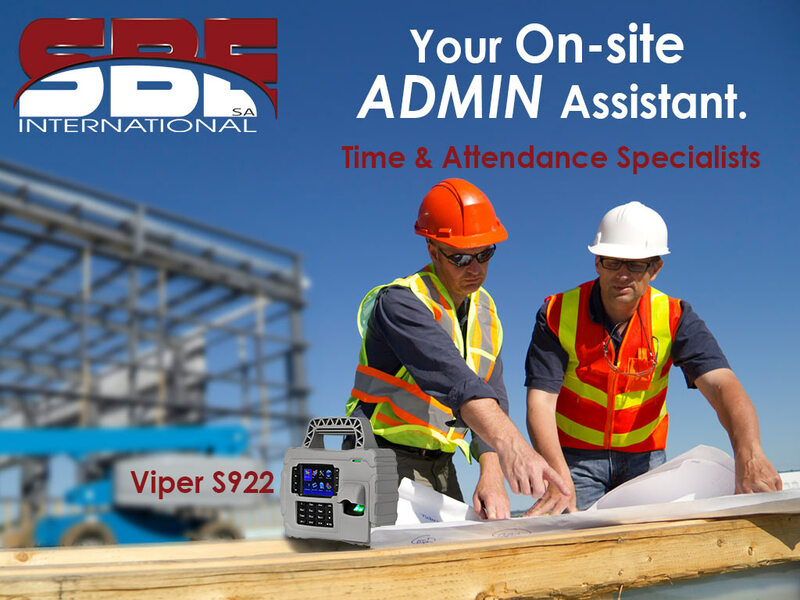 The Viper S922 is packed with a backup battery and a 12v car charger to enable hours and even days of remote clocking facilities. The water and shock resistant device, is the perfect hardware for the industry. With permanent and temporary workforce on-site, it’s easy to enroll and manage your workers ON-site, and track their clockings via our cloud servers. The live tracking of data logs, makes it easier to calculate daily and weekly wages, with our wage calculator print out. With the use of biometric fingerprint systems, you eliminate fraud on hours and “buddy-clocking”. With workers forced to use their fingerprints to calculate their hours worked, they can no longer commit fraud by coming late for work, take longer lunches and leave early. They are tracked with the a simple IN or OUT action, where the software calculate their hours automatically and log the events. The Viper TNA software solution are able to provide various functions and reports, calculate custom shifts and export to major payroll companies incl VIP and PASTEL. The cloud data management function on selected devices enables you to monitor your log reports anywhere in the world using an internet browser. We pride ourselves with our nationwide installations, training and telephonic support services to assist any client, anywhere. We believe in our products and services and reach out to our clients with a smile.